Pollcast host Éric Grenier is joined by Ian Brodie, Stephen Harper's former chief of staff, to discuss what lessons Alberta's new United Conservative Party can learn from the 2003 federal PC-Alliance merger. The CBC Pollcast, hosted by CBC poll analyst Éric Grenier, explores the world of electoral politics, political polls and the trends they reveal. Fourteen years ago, Canada's two right-of-centre parties — the Canadian Alliance and the Progressive Conservatives — merged to form the Conservative Party of Canada. Within three years, the newly united right was in government. On Saturday, Alberta's two right-of-centre parties also voted to merge, with hopes of dislodging the New Democrats from power in the next provincial election. Are there any lessons Alberta's new United Conservative Party (UCP) can learn from that 2003 merger? At the time, the PCs and Alliance were facing what was expected to be a Paul Martin juggernaut. The Liberals were at 51 per cent in the polls in the spring of 2003, trailed at length by the PCs at about 19 per cent and the Alliance at 11 per cent. Their predicament focused minds. 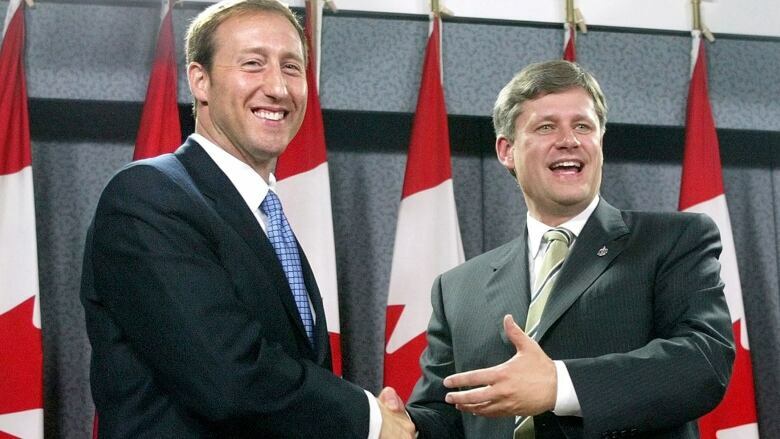 Before the end of the year, the newly-minted leader of the PCs, Peter MacKay, and the leader of the Canadian Alliance, Stephen Harper, were able to announce that a deal had been worked out. The Conservative Party of Canada was born. But the merger was not without its difficulties. A handful of PC MPs, including Joe Clark, a former leader of the party, opted not to join the new party. Others, like Scott Brison — now a cabinet minister in Justin Trudeau's government — crossed the floor to the Liberals. And after selecting Harper as the merged party's first leader, the Conservatives had only a few short weeks to prepare for the 2004 election campaign. The United Conservatives in Alberta will probably have more time to prepare. The province's next election isn't scheduled until 2019. And the NDP today doesn't look like the unstoppable force that Martin's Liberals appeared to be in 2003-04. But there are, nevertheless, some similarities between the two unite-the-right movements. To discuss what lessons today's UCP can draw from the 2003 merger, Pollcast host Éric Grenier is joined by Ian Brodie, an associate professor of political science at the University of Calgary and a former chief of staff to Stephen Harper. Listen to the full discussion above — or subscribe to the CBC Pollcast and listen to past episodes. Follow Éric Grenier and Ian Brodie on Twitter. Alberta's new United Conservative Party is a go. What happens next?